You'd be hard pushed to find a better presented, off-the-shelf mass produced pro kit than this. It looks terrific, with Pearl's deserved reputation for attention to small details. It's a bit heavy and the relatively thick shells might not be everyone's ideal. With the weighty die-cast hoops the result is a bright, tight, efficient sound, but there's still the warmth and clout of maple. Simple, user-friendly setup. Focused, tight sound with good ambience. Looks terrific. Limited size options. A bit heavy. Not much else. Pearl has always produced one of the widest ranges of any of the top manufacturers. While this is admirable it can also be confusing, and it's not helped by Pearl giving its series obscure titles like 'MMP' or 'SBX'. Now, here's the 'MCX'. 'MC' equals Masters Custom, and we don't know about the 'X', but the drums are maple. The Masters series is a professional range that slots in above Pearl's starter Forum and budget Vision lines. However, it's not quite so luxurious as either the mega-bucks Reference or Masterworks. MCX replaces the Session series and is a sort of bargain basement version of the already established Masters Custom Premium. The reason for this is that the MCX is available only as six-ply maple, in a limited range of sizes and just five finishes. The Premium, though, is made with two shell choices: six-ply (like the MCX) or four-ply with reinforcing rings, both in maple or birch. Our review kit is 22"x18", 10"x8", 12"x9" and 14"x14". There's no snare drum, although you can buy a matching wood 14"x5½" or 6½". Two other four-shell packs are offered, and you can buy extra drums individually. 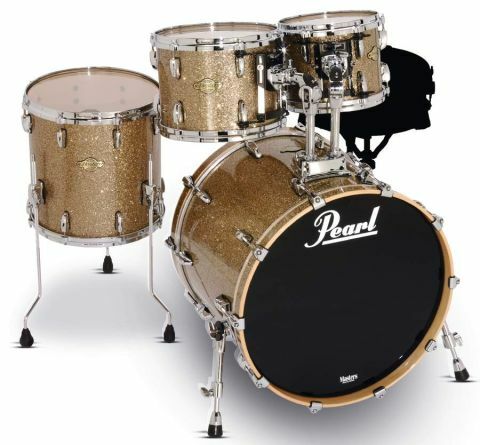 MCX shells are Pearl's trusty 7.5mm six-ply maple. 7.5mm is a little thicker and heavier than many top-end drums these days. The result should be to make the shells stronger and heavier, and also a fraction louder and brighter. Looking inside the shells, you'll notice that Pearl's are slightly different from most others in that they have traditional, overlapped scarf joints. All the review shells were perfectly round and between 1 and 3mm undersized, allowing a bit of clearance for the head collar. The sharp bearing edges have a 45-degree cut right up to the outermost ply, with just the last ply routed over. They're among the best finished we've seen, absolutely smooth and flat. The review kit is finished in a luxurious Delmar bronze glitter wrap. There are two other wraps and two lacquer finishes also available. This is a much narrower choice than the 30 Masters Premium finishes, but it means that the MCX is more readily available in the shops, whereas the Premium is special order. Certainly the review kit looked fantastic, and if you like one of the five finishes you could save 20 percent on the equivalent Masters Premium. The two small toms are mounted via Pearl's OptiMount isolation brackets, a particularly sturdy system that grips both top and bottom lugs yet is still quite unobtrusive. Combined with the thick shells and die-cast hoops, it makes the drums noticeably heavier than some others. For example, on a set of bathroom scales the 10"x8" was 31kg while a Yamaha 9000 10"x8" (with no isolation bracket) was 25kg. Every detail of the build should bring a smile to your face. MasterCast die-cast hoops and Masters Bridge lugs are beautifully chromed. All lugs and bass drum claws have rubber isolation gaskets, the lugs have brass threaded inserts and the stainless steel tension rods have white nylon washers. The bass drum hoop has a steel plate for scratch-free pedal mounting. Finally, there's a full compliment of 20 lugs on the 22" kick, whereas the previous Session series had 16. Setting up is simple, as all the drums arrive preassembled with factory-tensioned Remo heads. The OptiMount brackets on the small toms are also fitted and ready to go - it's just a matter of sliding them onto the familiar twin arm bass drum mount. These days, toms are more often mounted on stands, but we're happy with this old school method - it's more stable and we like the way the sounds of the three drums intermingle and warm one another. Many drummers don't, of course, in which case you can always use stands, although that would leave you with a bass drum fitted with a superfluous tom mounting block. On this relatively heavy 7.5mm shell, I don't think it makes any great difference. Again, if you want an un-drilled six-ply kick you're back in special-order Masters Premium territory. Toms are fitted with clear Ambassadors, top and bottom, which arrive tensioned right up high, giving a real jazzy ping. The rather thick shells and die-cast hoops accentuate this focused, tight sound and (perhaps with a smaller kick) you'd have a great small jazz set. Taking a half turn off top and bottom heads brought the toms into more of a fusion tuning, still with easily definable pitches, but punchier with a touch more sustain. Decay is nicely controlled and there's no need for even the slightest slither of Moongel. Backing off a half turn further we're into the rock and dirty funk area, and still the die-cast hoops and thick shells hold the tuning and keep the sound under control. There's no lack of ambience, but no wild, discordant humming either. The bass drum comes with both heads intact and again tuned high. Pearl supplies a Remo Dynamo circular template so that you can cut a 5" hole in the black front logo head. We imagine most customers will do that sooner or later but, personally, when playing un-mic'ed small gigs recently, we're happy leaving both heads intact. We remove the front head, loosely secure a Dave Weckl sausage dog cushion against the batter, replace the resonant and bash away. With the Remo Powerstroke, the sound is quite hard and bangy, not too boomy, even with this minimal damping. For a warmer, fatter sound we'd use an Aquarian SuperKick but, as with the toms, we soon found the kick is readily controlled with good definition. So, to go through the tuning stages again: starting with the tight factorytuned kick batter you have more of a big band jazz sound. This time we slackened off by three or four half turns until reaching the point just above wrinkle-free. We returned the front head to a full turn above that, around medium tension, to brighten the resonance. The result was a good mix of attack and depth with warm tone but not too much boom or low-end rumble. We were chuffed that within just a few minutes of liberating the drums from their cardboard prison we'd discovered a versatile, user-friendly kit. Maybe it does not have quite the depth or sustain of the four-ply Premium, but it's all the more manageable and easy to mic because of that. A workhorse, touring kit for most styles of player. Pearl to the core.